Roman Catholicism is a religion that does not teach the true gospel of salvation that is taught in Scripture. Therefore, its clergymen, and clergywomen, are not believers in the Jesus of the Bible. Jesus warned his followers of false prophets, and called them ravenous wolves. He said that they can be identified by their fruits. The bad fruit of Roman Catholic clergymen is their damnable heresies, and where there is false doctrine there can also be found other bad fruits. Mother Teresa’s refusal to accept food or drink (and her taking the money instead for the poor) is nothing but an affectation aimed at impressing the media (“Deifying Diana, an icon for India”, 5 October). She routinely travelled first class on planes. And a large amount, if not the majority, of the money she collected was spent on religious activities, such as on the upkeep of the hundreds of nunneries (which have no charitable functions) that her order maintains around the world. Re-using old needles in her homes in India is normal practice (I speak as a former volunteer at her home for the dying in Calcutta), but she herself had treatments which only the richest Indians can afford; she also had treatment at exclusive clinics such as the Scripps at La Jolla, California. It is true that she was not too well disposed toward actresses playing her, but it is also true that she appeared in at least a dozen documentaries advertising her faith and her “humility”. The late Mother Teresa’s saintly image has been called into question by researchers conducting an in-depth study of her life. Mother Teresa may have spent the vast majority of her 87 years looking after the sick and poor, but researchers from Montreal and Ottawa universities have now raised questions over the ‘dubious’ nature of her care, as well querying her “questionable” political contacts. The researchers also raised concerns over the Nobel Peace Prize winner’s ‘suspicious’ financial arrangements, which they claim saw large sums of money transferred into her ‘secret’ bank accounts. Writing in the Journal of Studies in Religion/Sciences after analysing around 300 documents surrounding Mother Teresa’s life, Dr Serge Larivie and Dr Genevieve Chenard say they have uncovered details that compromise the Albanian-born nun’s saintly image. 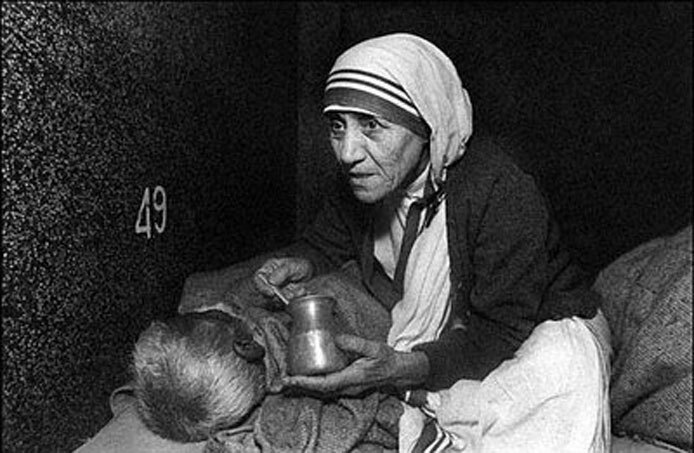 They claim that many of the ‘missions’ set up by Mother Teresa were unfit for their inhabitants, calling them ‘homes for the dying’ due to their poor hygiene and a shortage of food, care and medication. The researchers believe a lack of money cannot be the reason for the poor conditions however, as Mother Teresa raised hundreds of millions of pounds during her lifetime, although much of that money apparently appears to have vanished into several ‘secret’ bank accounts reportedly kept by the nun. The researchers also questioned why, despite openly offering prayers and medallions bearing depictions of the Virgin Mary, Mother Teresa provided no direct or monetary aid to victims of a number of natural disasters in India. The researchers went on to query Mother Teresa’s politics and political contacts, accusing her of accepting a financial grant from the brutal Duvalier dictatorship, which is deemed responsible for the murders of over 30,000 Haitians between 1957 and 1986. Dr Larivie said that much of Mother Teresa’s saintly public image was shaped by the BBC journalist Malcolm Muggeridge, who shared her conservative Catholic views, particularly on abortion, and whose promotion of her led to the nun’s international fame. Despite the negatives, Dr Larivie accepts there are many positive aspects to Mother Teresa’s life and work. Mother Teresa died in 1997 and was beatified by the Catholic Church in 2003, leaving her just one miracle away from sainthood.